44 x 42" engine, Shepard Iron Works, Buffalo, NY. firebox boiler 9'6" x 20', Shepard Iron Works, Buffalo. Used as fishing & dive platforms until burned 1931. 1862, May 3 Enrolled Buffalo, NY; ran Buffalo - Chicago, IL on People's Line for 40 yrs. 1864, Apr 13 Owned Western Transportation Co., became Western Transit Co. in 1884. 1865, Apr 25 Readmeasured 212 x 32.7 x 12.7; 1116.53 gross tons; 2 decks; 1 mast. 1868, Feb Received fore & aft compound engine. 1868, Aug 8 Collided with & sank schooner DUNDENBURG on Lake Huron off thumb area. 1870, Jun 6 Collided with & sank propeller WABASH off Port Huron; repaired. 1880's Ran Buffalo, NY - Duluth, MN. 1882, Aug 5 962 net tons. 1883, Oct Grounded Stag Island near Port Huron. 1884 Owned J. Allen Jr., Buffalo, NY. 1891, Jul 17 Stranded AuSable reef; pulled free 5 days later. 1894, Oct Grounded Sugar Island. 1898, Apr 11 Owned Northern Transit Co., Cleveland, OH; repaired & recaulked. 1900, Jul 7 Grounded Little Sturgeon in heavy fog. 1901 Owned George Hansheer, Cleveland, OH. 1902, Apr 1 Owned Barry Brothers Transportation Co., Chicago, IL; ran Chicago - Muskegon, MI. 1902 Extensive repairs Manitowoc, WI; ran Chicago, IL - Green Bay, WI. 1903 Ran Detroit, MI - Cleveland, OH. 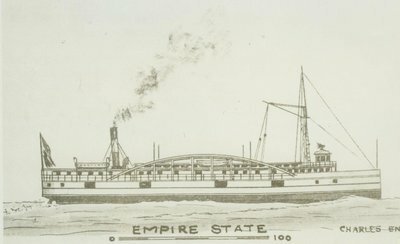 1903, Sep 19 Laid up for libel proceeding by American Shipbuilding Co.
1903, Oct 20 Sold in receivership to F.H. Riebenach, Alpena, MI. 1903, Oct 29 Owned John McCoy, Milwaukee, WI. 1903, Nov 3 Owned Barry Brothers Transportation Co., Chicago, IL; ran Chicago, IL - Milwaukee, WI. 1904 Received steeple compound engine 24 + 54 x 39 by H.G. Trout, Buffalo. 1906, Dec 25 Burned at dock, Chicago, IL. 1908, May 12 Owned Bennett & Schnorrbach, Muskegon, MI. 1908 Rebuilt as barge by Leatham D. Smith, Sturgeon Bay, WI; 1 deck; no masts; 637 gross & net tons. 1911, Sep Owned Soren Termanson, Sturgeon Bay. 1911 Owned Sturgeon Bay Stone Co.
1916, Mar 18 Abandoned Sturgeon Bay, WI.